-7- with the City Council for the purpose of alerting them to this possibility and to inform them of the ground work and feelings of the Commission on the matter. At a luncheon meeting with the City Council this information was given to them. 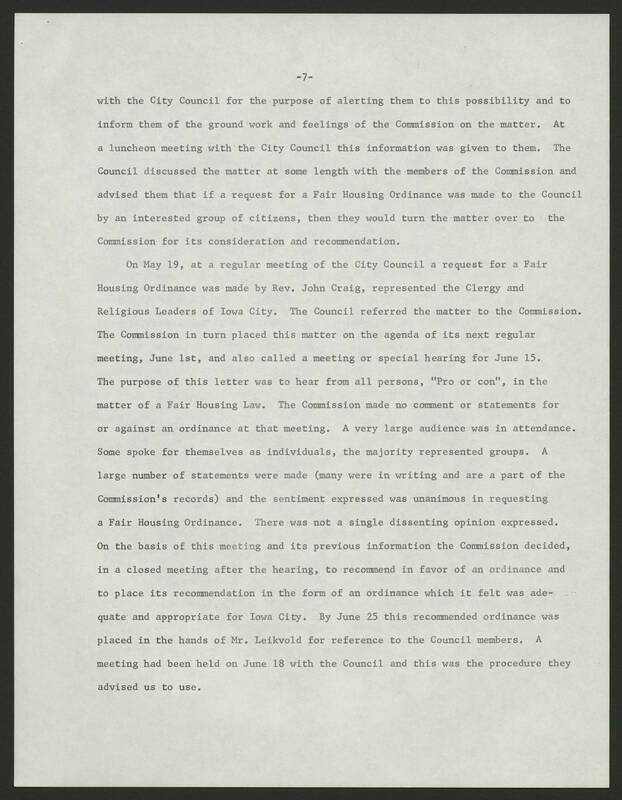 The Council discussed the matter at some length with the members of the Commission and advised them that if a request for a Fair Housing Ordinance was made to the Council by an interested group of citizens, then they would turn the matter over to the Commission for its consideration and recommendation. On May 19, at a regular meeting of the City Council a request for a Fair Housing Ordinance was made by Rev. John Craig, represented the Clergy and Religious Leade4rs of Iowa City. The Council referred the matter to the commission. The Commission in turn placed this matter on the agenda of its next regular meeting, June 1st, and also called a meeting or special hearing for June 15. The purpose of this letter was to hear from all persons, "pro or con", in the matter of a Fair Housing Law. The Commission made no comment or statements for or against an ordinance at that meeting. A very large audience was in attendance. Some spoke for themselves as individuals, the majority represented groups. A large number of statements were made (many were in writing and are a part of the Commission's records) and the sentiment expressed was unanimous in requesting a Fair Housing Ordinance. There was not a single dissenting opinion expressed. On the basis of this meeting and its previous information the Commission decided, in a closed meeting after the hearing, to recommend in favor of an ordinance and to place its recommendation in the form of an ordinance which it felt was adequate and appropriate for Iowa City. By June 25 this recommended ordinance was placed in the hands of Mr. Leikvold for reference to the Council members. A meeting had been held on June 18 with the Council and this was the procedure they advised us to use.